The numbers do not lie. The season premier of the 11th Doctor Who character was received well by American viewers. BBC America can give themselves a pat on the back because this 5th season of the “new” Doctor Who surpassed anything that the SyFy channel was able to do with a Doctor Who season premier. BBC America scored big with Doctor Who’s major demographic, people that are alive and 25-54 years of age. The total number of viewers that watched the season premier either live or same day was 1.2 million viewers. I thought it was awesome to read that Doctor Who has at least 1.2 million faithful fans in North America. 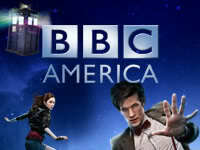 Thank you BBC America for continuing the series in the States. More stats can be read here at the Doctor Who News Spot. Posted: 04|22|10 at 6:20 am. Filed under: New Doctor Who.